I’m pretty sure I promised you the rest of my winter decor tour 2 weeks ago and then I sort of forgot the Mr. was whisking me away from the winter sludge to sit in sunny Mexico with friends. Not sure how that one slipped my mind :) but it was a fantastic week of napping in the sun and drinking margaritas. We are back to reality and I’m definitely missing my umbrella drink and beach view. It’s all piles of laundry and potty training duty over here, (just pee already Charlie, how many different piles of snow must you sniff!?) so I thought I would quick post the photos I forgot last week. 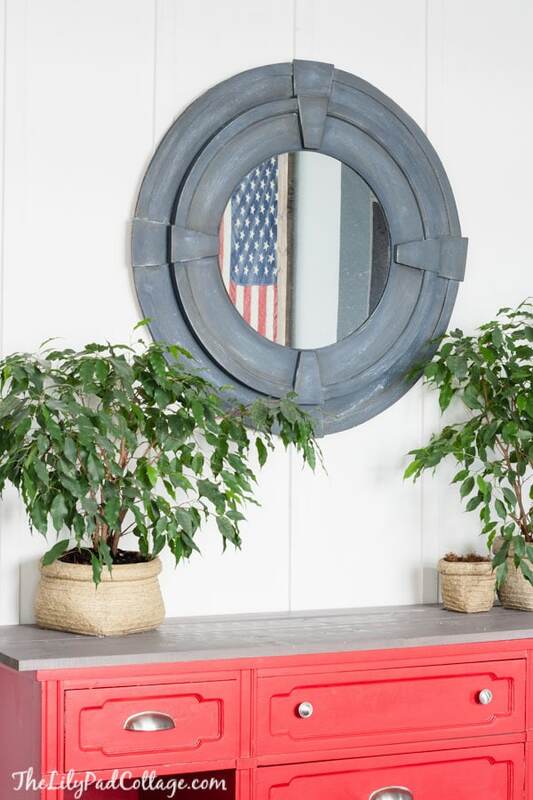 My DIY mirror has been in hibernation all winter, so I moved it over the buffet table along with my ficus trees and I love that come spring it will reflect the lake view. Well, once I remove the inch of dust on it first yikes! I’m still sort of swapping things out and finding pine needles lurking in the corners, but for now it feels happy in here. Oh, and to those of you who have been waiting forever on me to post the upstairs flooring makeover, you are about to be happy campers, the first of several posts is coming later this week – hooray! Looks great and if you hadn’t mentioned the dust on the mirror I would have never noticed :-) At least no-one went by and wrote “dust me” on the mirror so you could REALLY notice. I am ready for spring — but I was ready for spring December 26th. Have a great week. Looks great! Can you tell me more about your American flag frame? I’m with you as well … Would love to know the details on how you did your flag frame! 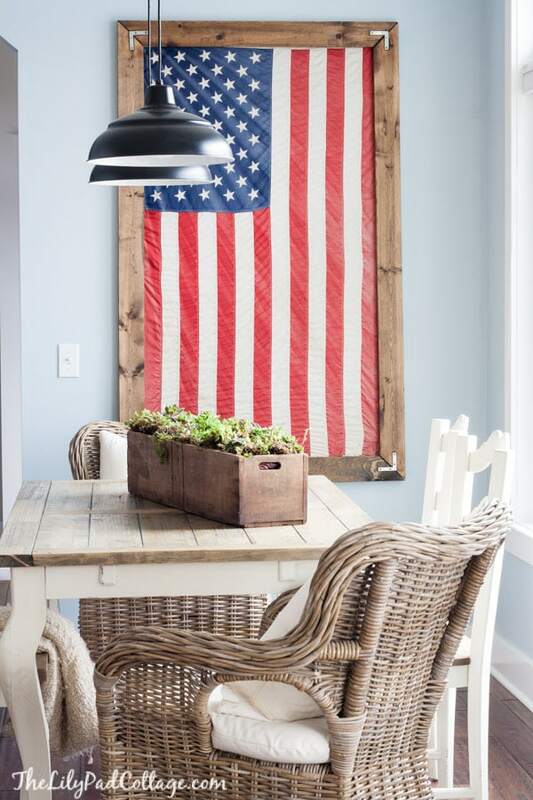 If you type flag or fourth of july in the search box on my site it should pop up a post with more detail, but I basically hung the flag on the wall, built the frame with old wood and some brackets and hung the frame over the flag. Thanks! If you type 4th of july or flag into my search bar the original post should pop up with more details! 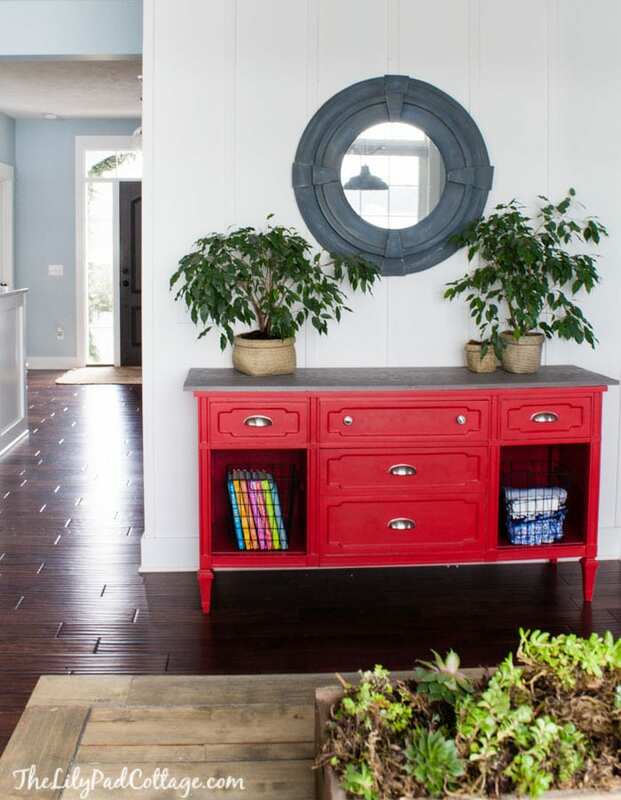 I love your red cabinet……what color and paint brand is it? And is it gloss? I want to do a cabinet in my bedroom and just love yours! It’s so refreshing and after this dreary winter I need something refreshing……where’s that pina colada and Alberto? Love the color pop of the red! I also love the succulents on the table they transition into spring so well.Thank you so much for the early morning inspiration! Looks lovely!!! Good for you on the trip to Mexico. How relaxing!!!! Blessings from Missouri! Thanks Maggie! The trees are from a local store called Flowerland, I’ve actually had them a year now – go me!! Welcome back Kelly. Love the simple touches of green. Hope you are doing well. Cannot wait to see the playroom. Have a great week. Love the wicker chairs. Can you give the source? Thanks for the inspiration! 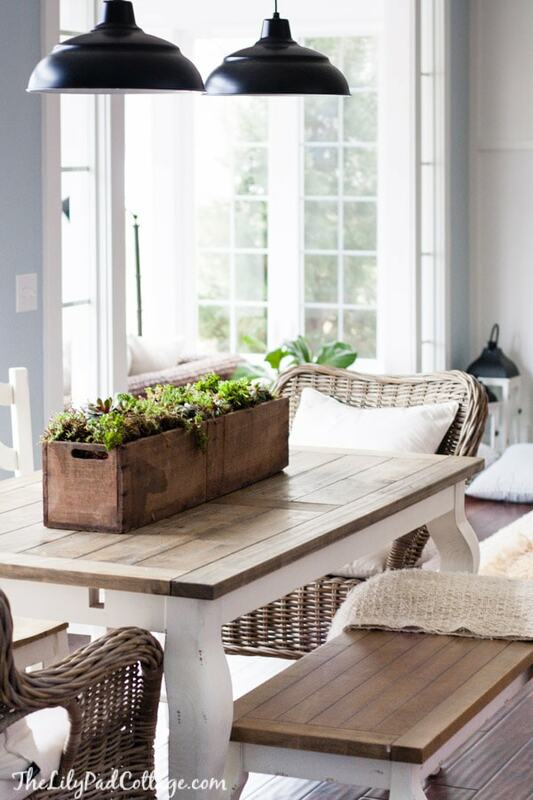 I, too, am wondering your source for the wicker chairs~ a casual comfortable setting ~ love the addition of a bench to a dining room table. We just purchased a cottage on the river. Complete remodel is in the works. Your décor is very similar to what I had in mind. Thanks for all the great ideas…..I love it! What type of flooring do you have? Is that a laminate or wood? Love the simplicity of your decor. I just started following a gardening site on Facebook, and she is always doing projects with them. Wonder if you’ve heard of it…Garden Answer….she’s very talented and has great advice of maintaining succulents. My husband and I went to Mexico, Isla Mujeres and had a marvelous time…little Island off the beaten path. You have tot take a boat to the island from Cancun to get there. We had wonderful weather, it was in October. But living on the East coast, I”m ready to go back!!! Good luck with the decor! Can’t wait to see more….. Your home is beautiful! I am wondering where you got your dining table set? It’s from World Market, unfortunately they don’t carry it anymore thanks! Love your decorating! 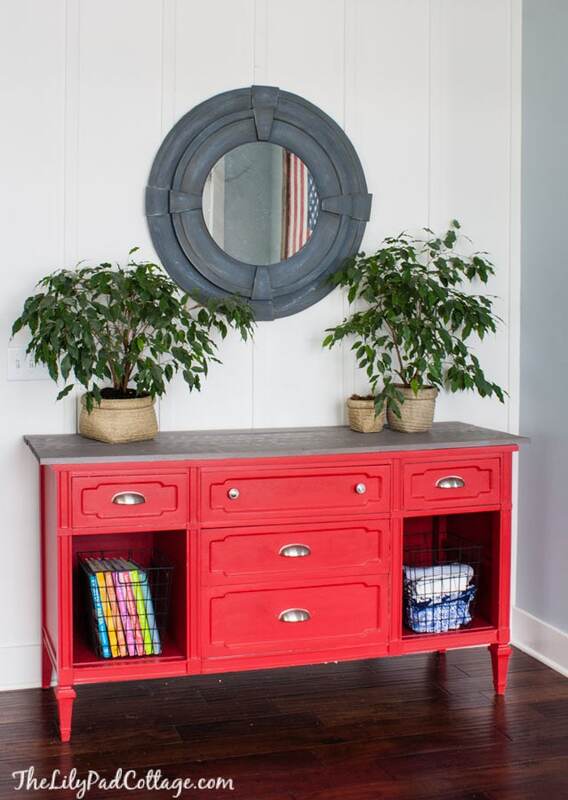 What color is the wall behind your beautiful red cabinet? I have just finished a board and batten wall and looking for the right white!! I have lots of blue (sea salt) and grays! Hi Joyce, it’s a white paint from Lowe’s I think the color is Silver Feather. Thanks! Where are your black pendant lights from? Love the pendant lights. May I ask where you purchased them? This is an old post but I think they were from Wayfair? Love the color of walls the blue shade is so fresh. What’s the name and brand ? 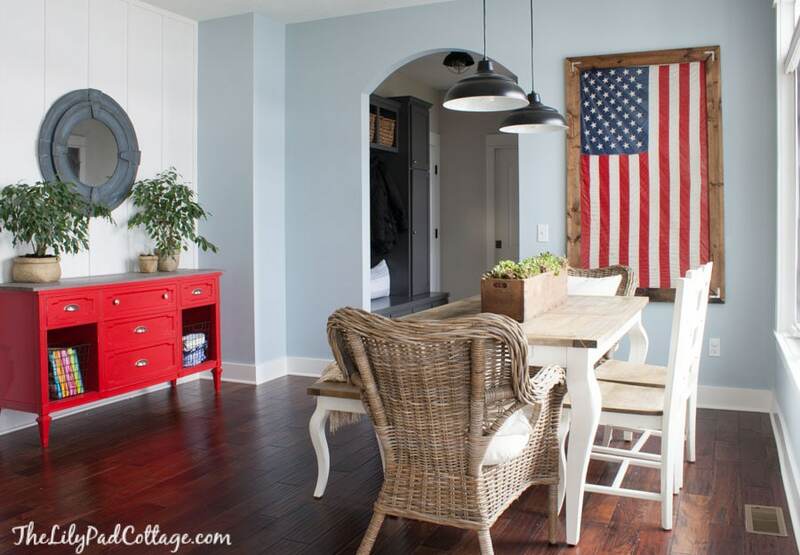 Hi Kelly — I love your style in the cottage you just sold and was just looking for the source on a few items. Loved the light blue/white striped rug in your kitchen, window boxes, paint color in your master bedroom, and Also liked your white bed frame with the storage areas and the wood hooks in the bathroom! You have great taste! Can’t wait to check out the rest of your site. Hi Liz, all of those posts are several years old so I don’t think you would be able to find any of the items any more. 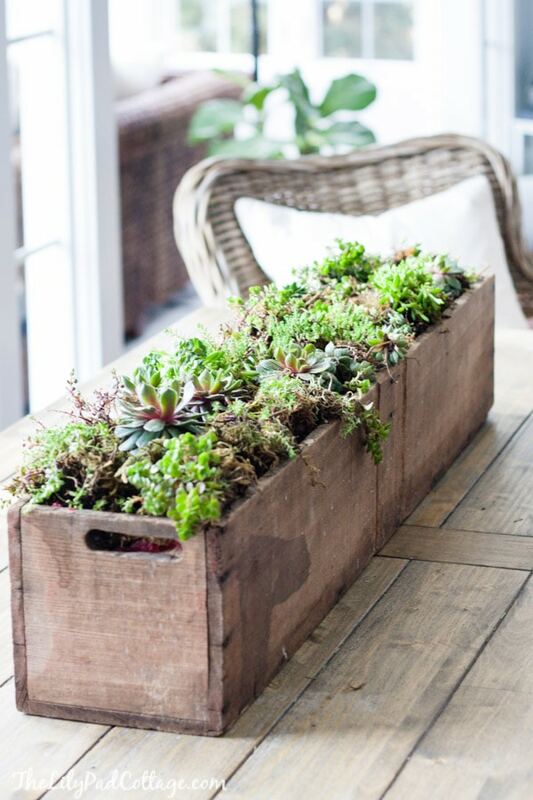 The window boxes were built by our builder and the bed frame was from Pottery barn – thanks! Hi! I’m wondering about where you got your two armchairs in the living room, I can’t find the source page for your living room but love the ssize I’d thise chairs! Thanks! They were hand me downs from my mom from a million years ago sorry I don’t have a source for you!